Tell your story. 3 records at a time. "The Birds" is a scary, scary movie. The expression suggesting something is "for the birds" always carries a negative connotation. Giving someone "the bird"? While it's one of my favorite activities, I find that the police don't really have a sense of humor about it. So when you're a passionate ornithologist, you probably feel like birds get a bad name for no good reason in the same way that the great Terence Trent D'Arby does. Yeah, I said it. So it came as no surprise that when ornithologist Jonathan Meiburg started a band, he named it after a bird--"Shearwater". And it didn't stop there. The former Okkervil River multi-instrumentalist has incorporated bird-related themes into several of his band's albums and their associated cover art. 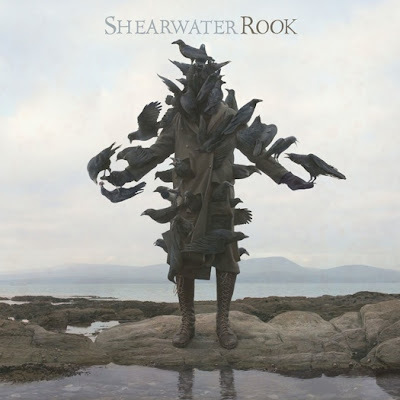 Take some time to check out Shearwater's albums and art here, if you'd like. My favorite of these is this week's featured cover, Rook. The cover art is actually a piece called "King of Birds" by two artists simply known as Kahn + Selesnick. The piece is part of an exhibit series known as Eisbergfreistadt (and no, I have no idea what it means). I first bought the album due to my love for Meiburg's role in Okkervil River and also based on a recommendation from my friend Ryin. The album contains beautiful, layered, powerful music and it lives up to the art found on the cover. In February of this year, Kahn + Selesnick brought this exhibit to Oklahoma City's Untitled (Artspace) along with a small, intimate benefit performance by Shearwater. Shearwater put on a great show and seemed pleasantly surprised and slightly impressed by the turnout and promised to return to Oklahoma City on their next tour (fingers crossed). After the show, I had a chance to look at the entire exhibit which was made up of drawings, photographs, physical pieces--it was honestly something that had to be seen to be fully appreciated. The link above will give you a glimpse, but the experience made a fan out of me and helped me to understand why Shearwater chose "King of Birds". The figure featured in the piece appears both powerful and haunting, human and non-human. I honestly don't know much about art, but I know that the image stays with you--something I'm sure was the intention of Shearwater for Rook. Visual art and music are separately powerful mediums--yet when coupled in a way such as is the case with Rook, it becomes greater than the sum of its parts in some way. Or, um...It's really wicked cool to hear and see. Ohhhh I love Shearwater! I think maybe you were the one who exposed me to them? Great pick. I think they always pick pieces of art for their covers, no? Yes, Angela. In fact, you came to that show with me, remember? 1. Fill in the blank: 3 of my records that/to/for/whose/from _______. 2. Snap a photo of your 3 records (conventional, weird, effects, whatever). 3. Tell us why these 3 records (or let the blank you filled in Step 1 suffice). Get creative/weird/overly personal/funny/whatever. 4. Provide your name or a clever alias and your location. Feel free to include a Twitter handle if you'd like. Music Blog + Routine = Betterpants!